We invite you to join our longstanding, safe, non-judgmental & caring support forums. We welcome survivors of all types of abuse & people of any faith or beliefs. 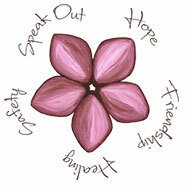 Our Almond Blossom logo symbolises these things - each petal representing one of our core priorities. We see them as the foundational supports of our organization, our goals, and our community. Recovery is difficult. It takes a long time. It can be frustrating. Sometimes it doesn't even seem possible. But it's so much better than the alternatives! And it is so much easier when we share the journey together. All content on this site is © 2019 Christian Survivors. All rights reserved. If you wish to use any content, please contact us All artwork on this site is copyrighted, and is not to be copied, or reproduced, without express written approval of the relevant artist!